LONDON--(BUSINESS WIRE)--Technavio analysts forecast the global human machine interface (HMI) software market to grow at a CAGR of more than 5% during the forecast period, according to their latest report. The research study covers the present scenario and growth prospects of the global HMI software market for 2017-2021. Technavio presents a detailed picture of the market by way of study, synthesis, and summation of data from multiple sources. 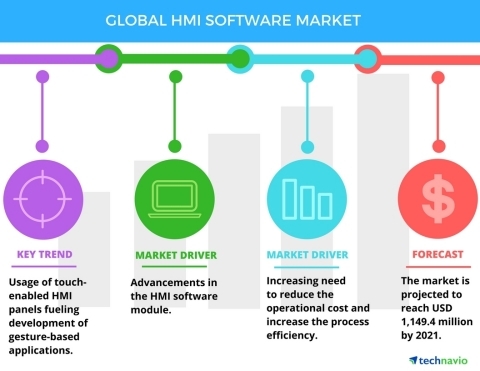 The global HMI software market is expected to witness a steady growth due to increasing demand from end-user industries for real-time monitoring and controlling functionality provided by systems. There is an increasing need for these applications in end-user industries, which will drive the demand for HMI software. The usage of analytics in industries to improve the efficiency, as well as design analytical models, is another reason for this growing demand. There are many developments and upgrading within the HMI software such as advancements in modules, which makes it easier for system integrated programming. Other developments include communication protocols that allow users to configure systems as per their requirements. This software helps in data logging and can be accessed with the help of cloud-based data storage or through serial ports. One of the main reasons for implementing automation within manufacturing plants is to reduce the operational cost and increase the process efficiency. There are many vendors that offer customizable solutions for HMI software. There are also HMI devices that can run on third-party software, making it much easier for end-users to acquire these devices. “HMI software helps in increasing the production efficiency and process visualization, which helps end-users in designing analytical models. It is very important for manufacturing plants to monitor and control each process, which makes process visualization and real-time data availability a necessity in plants,” adds Bharath. The main purpose of using HMI solutions in manufacturing plants is to monitor and control process parameters and collect real-time data. HMI solutions aid in developing trend-charts with real-time data for analyzing the process, thereby developing a process and production plan. There is an increase in the usage of analytics among end-user industries as they aid in quantifying the status of plants and increase the visibility of process flow and parameters through data visualization. HMI software acts as a backbone for analytics with the help of real-time data available. Technavio analysts forecast the global human machine interface (HMI) software market to grow at a CAGR of more than 5% during the forecast period, according to their latest report.